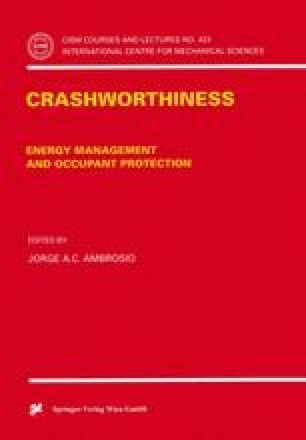 The safety of occupants and their potential survival in crash events in transportation systems involve topics as different as interior trimming of the passenger compartment structural crashworthiness, or restraint systems efficiency. The analysis of such aspects is currently done during the initial design stages. Current design methodologies entail the use of different computer simulations of increasing complexity ranging from simplified lumped mass models [18.1–2], multibody models [18.3] to complex geometric and material nonlinear finite element based representations of occupant [18.4] and vehicle structures [18.5]. Some well-known simulation programs are now available: PAM CRASH [18.5], WHAMS-3D [18.6] and DYNA 3D [18.7] for structural impact and CAL3D [18.8] and MADYMO [18.9] for occupant dynamics. These programs are able to simulate with relative detail frontal, rear and side impact scenarios. However, in most cases, the structural impact and the occupant dynamics are treated separately. The structural crash analysis provides the relevant accelerations pulses, which are used in the occupant analysis phase. The injury indices such as HIC and chest accelerations [18.10-11] can then be evaluated to access design performances.